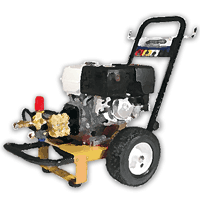 Prospective sewer jetter users sometimes ask what pressure washer works best for cleaning drains. While developing and testing the Clog Hog pressure washer sewer jetters we learned a few interesting details from pressure washer service mechanics. Typical residential-grade pressure washers you can buy for under $500 have pumps with a life expectancy of a few hundred hours at most. For many homeowners who spend a few hours per year power washing a deck or boat, this equates to many years of service. But if you’re going to run your unit, say, more like 10 hours per month you might look for a commercial-grade machine that typically cost around $700 and up. It seems that every pressure washer mechanic has a different opinion about which manufacturer produces the best machines. This makes it tough to recommend any particular brand of pressure washer. If you’re buying a commercial-grade machine, look for a unit that delivers around 3.5 GPM and is rated at least 3,000 PSI. This size unit gives you strong cleaning and pulling power for at least 100 feet of sewer jetter hose. If you’re buying a residential gas-powered machine, look for a unit that delivers 2.5 to 2.9 GPM and is rated as close to 3,000 PSI as possible. This will provide very good cleaning and pulling power with a sewer jetter of up to 100 feet in length. If you’re buying an electric pressure washer, look for a unit that delivers close to 2.0 GPM and is rated as close to 2,000 PSI as possible. This type of machine will produce adequate pulling power for over 50 feet of line if you’re jetting uphill from an outdoor cleanout, and usually provides power sufficient to jet 100 feet downhill from an indoor drain opening. Our article about how to unclog a sewer drain with your pressure washer gives more information about the performance you can expect with different types of machines.